How many satellite launches does it take to get to Mars? On Tuesday, SpaceX successfully launched a commercial communications satellite into orbit after two abortive attempts, a major milestone in entrepreneur Elon Musk’s lofty mission to build a private space program. In 2012, an ISS supply mission made SpaceX’s Dragon capsule the first privately owned spacecraft to dock with the station; Musk himself has become one of the figureheads of a new, aspirational entrepreneurship that prizes impossible ideas alongside traditional business. And SpaceX’s success comes after years of worry about whether NASA is still capable of the grand feats it achieved in the mid-20th century — and speculation that SpaceX and its many competitors, not an old guard of aerospace companies and government agencies, will be the future of extraterrestrial exploration. The launch isn’t just a springboard for more contracts. It’s the start of a revenue stream that Musk hopes will help the company reach its long-term goal: sending humans to Mars. 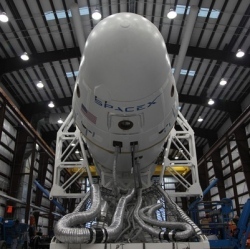 Aerospace journalist Michael Belfiore says SpaceX is miles ahead of similar startups, calling it "the lynchpin of America’s manned space program." Competitor Orbital Sciences has an established cargo program — this fall, it became the second private company to have a ship dock with the ISS — but it’s not planning manned trips, and Sierra Nevada’s Dream Chaser is too dependent on federal funding, Belfiore tells The Verge. "They only go as far as NASA goes. And that funding is always in question." Blue Origin, backed by Amazon’s Jeff Bezos, is more mysterious. The company was last seen firing its latest engine at a Texas test site, and NASA said it was making "steady progress" in its work as a commercial partner to the agency. But Musk has mocked its prospects. During a battle over the lease of a space shuttle launch pad, he said he’d be happy to let Blue Origin use the pad if it could produce a craft capable of docking with the ISS in the next five years: "Frankly, I think we are more likely to discover unicorns dancing in the flame duct."